December 28, 2010 - Boeing began resume flight test activities on the 787 Dreamliner after suspending flight test last month following an in-flight electrical incident on a test flight in Laredo, Texas. Boeing has installed an interim version of updated power distribution system software and conducted a rigorous set of reviews to confirm the flight readiness of ZA004, the first of the six flight test airplanes that will return to flight. 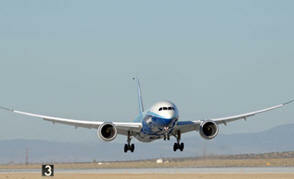 "Initially, we will resume a series of Boeing tests that remain to be completed in the flight test program. That testing will be followed later by a resumption of certification testing," said Scott Fancher, vice president and general manager of the 787 program. Testing included an intentional deployment of the Ram Air Turbine (RAT), which is a small turbine that is deployed when back-up power is required. Boeing and Hamilton Sundstrand completed testing of the interim software updates earlier this week. Verification of the system included laboratory testing of standalone components, integration testing with other systems, flight simulator testing and ground-based testing on a flight test airplane. In the last several weeks, the company continued ground testing as part of the certification program. Additional ground testing will be done by the company on the production version of the airplane to further verify performance of the changes being made. "As we return to flight test and determine the pace of that activity, we remain focused on developing a new program schedule," Fancher added. "We expect to complete our assessment of the program schedule in January." During approach to Laredo, Texas, on November 9the, a Boeing 787 Dreamliner on a test flight, airplane ZA002 lost primary electrical power as a result of an onboard electrical fire. The pilots executed a safe landing and at all times had positive control of the airplane and all of the information necessary to perform that safe landing. Engineers have determined that the fault began as either a short circuit or an electrical arc in the P100 power distribution panel, most likely caused by the presence of foreign debris. The design changes will improve the protection within the panel. Software changes also will be implemented to further improve fault protection. The P100 panel is one of five major power distribution panels on the 787. It receives power from the left engine and distributes it to an array of systems.